See the images below depicting placental abruption. Placental ischemia: Contrast-enhanced CT image through the level of the placenta in a patient with acute trauma demonstrating an ischemic region affecting more than half of the visualized portion of the placenta. Ischemia was found to be secondary to placental abruption from a deceleration injury. Placental abruption: Fluid collection with a bright signal posterior to the placenta and just superior to the internal os in this T2-weighted sequence demonstrating a hyperacute hemorrhage. Marginal placental hemorrhage: Color Doppler flow image demonstrating the absence of flow in the retroplacental fluid collection. Ultrasonography is usually the preferred study. The primary benefits of ultrasonography include avoiding ionizing radiation, the dynamic nature of the examination, and its speed and availability in most centers. In patients with severe trauma, CT scanning may be required to evaluate for abdominopelvic injuries. Although ionizing radiation poses an obvious fetal risk, in critical circumstances, its use may be vital to detect an underlying condition that jeopardizes the patient's life. According to Wei and colleagues,  placental abruptions are often overlooked on CT scans, but the authors found that sensitivity can be improved by systematic evaluation of the placenta and that specificity can be improved by increased training regarding normal placenta pathology. 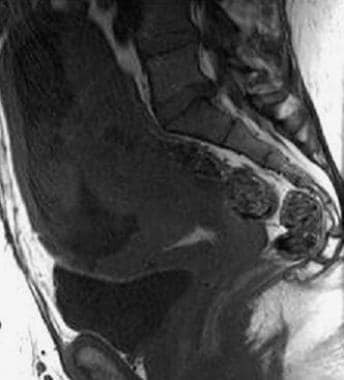 In their study of 44 CT scans of pregnant women who presented with abdominal traumatic conditions, there were 7 placental abruptions, all of which were identified on CT scanning. The risk of radiation-induced fetal effects is greatly reduced as gestational age increases. Undertake a risk assessment before obtaining a CT scan. If obtaining a helical CT examination, increase the scan pitch (ideal for reducing radiation dose). Placental ischemia: Contrast-enhanced CT image demonstrating a wedge-shaped region of ischemia in the lateral aspect of the placenta. Healthy heterogeneous placenta: Contrast-enhanced CT demonstrating the typical degree of heterogeneity in the perfusion of the placenta. This pattern should not be mistaken for ischemia or abruption. Placental hemorrhage: Large, oval-shaped bright collection in the inferior aspect of the placenta in this T2-weighted image demonstrating the hyperacute phase of hemorrhage within the placenta. 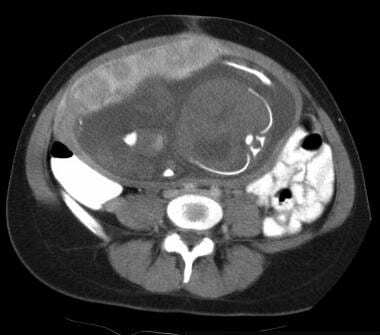 For abruption, MRI is best used to detect hematomatous collections and the physical separation of the placenta. Generally, placental ischemia cannot be accurately diagnosed with MRI. The appearance of hematomas on MRI widely varies, depends on age, and follows the same changes as hematomas in other parts of the body. The signal characteristics listed in the table below are based on conventional spin-echo techniques. Gradient-echo sequences may also be used to demonstrate blooming. 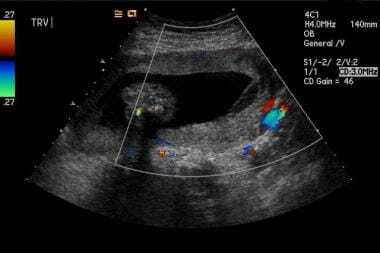 Marginal placental hemorrhage: Ultrasonographic image showing a hypoechoic fluid collection in the subchorionic region with extension into the retroplacental area. Ultrasonography has a low sensitivity but a high specificity for placental abruption. According to Glantz and Purnell, the sensitivity, specificity, positive predictive values, and negative predictive values of ultrasonography are 24%, 96%, 88%, and 53%, respectively. Most significantly, negative ultrasonographic results do not exclude abruption, while positive ultrasonographic results indicate a high probability of abruption. Location and extent of abruption correlate with fetal mortality. The volume of the hematoma (estimated by [length × width × height]/2) and the amount of placental detachment are the most accurate predictors of pregnancy outcome. A hematoma larger than 50 mL or a placental detachment greater than 50% indicates a guarded prognosis. Patients with fundal or corpus hematomas have a worse prognosis than those with supracervical hematomas. Fetal mortality is highest in retroplacental abruptions. The retroplacental hypoechoic complex (consisting of the uteroplacental vessels and myometrium) should be thinner than 1-2 cm. Consider a retroplacental hemorrhage or a uterine contraction if the complex is thicker. In addition, be aware of the potential to misinterpret hypoechoic fibroids as signs of placental separation. Several processes can be confused with a retroplacental hematoma on ultrasound. A retroplacental myometrial contraction can exert mass-effect upon the placenta. However, the contraction is transient and usually more homogeneous in appearance than a hematoma. 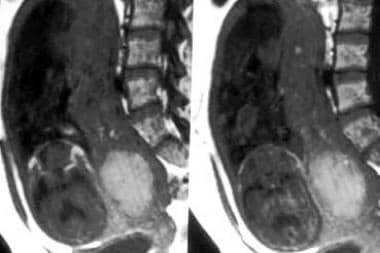 A retroplacental mass such as a leiomyoma can also mimic a hematoma. The normal subplacental vascular region is less echogenic than the placenta and can also mimic a hematoma. However, it does not have mass-effect on the placenta and may have visible vascular spaces. Acute retroplacental hemorrhages can have similar echogenicity to overlying placenta and appear as a thickened placenta. 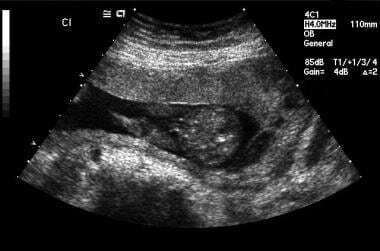 Subchorionic hemorrhages can resemble an elongated placenta or can mimic an intrauterine mass. Boisramé T, Sananès N, Fritz G, Boudier E, Viville B, Aissi G, et al. [Abruptio placentae. Diagnosis, management and maternal-fetal prognosis: a retrospective study of 100 cases]. Gynecol Obstet Fertil. 2014 Feb. 42 (2):78-83. [Medline]. Rozler MH. 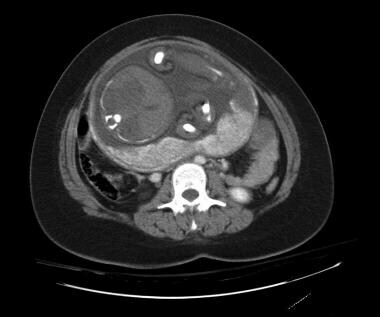 Blunt abdominal trauma: computer tomography, ultrasound, or diagnostic peritoneal lavage- when and by whom?. Emerg Radiol. 1998. 5:403-409. Goldman SM, Wagner LK. Radiologic ABCs of maternal and fetal survival after trauma: when minutes may count. Radiographics. 1999 Sep-Oct. 19(5):1349-57. [Medline]. Goldman SM, Wagner LK. Radiologic management of abdominal trauma in pregnancy. AJR Am J Roentgenol. 1996 Apr. 166(4):763-7. [Medline]. Lowdermilk C, Gavant ML, Qaisi W, West OC, Goldman SM. Screening helical CT for evaluation of blunt traumatic injury in the pregnant patient. Radiographics. 1999 Oct. 19 Spec No:S243-55; discussion S256-8. [Medline]. Wei SH, Helmy M, Cohen AJ. 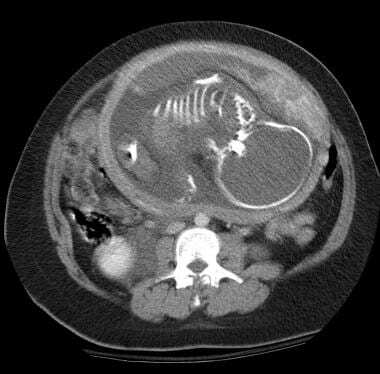 CT evaluation of placental abruption in pregnant trauma patients. Emerg Radiol. 2009 Sep. 16(5):365-73. [Medline]. [Full Text]. Saphier NB, Kopelman TR. Traumatic Abruptio Placenta Scale (TAPS): a proposed grading system of computed tomography evaluation of placental abruption in the trauma patient. Emerg Radiol. 2013 Sep 22. [Medline]. Kopelman TR, Berardoni NE, Manriquez M, Gridley D, Vail SJ, Pieri PG, et al. The ability of computed tomography to diagnose placental abruption in the trauma patient. J Trauma Acute Care Surg. 2013 Jan. 74(1):236-41. [Medline]. Shellock FG, Kanal E. Magnetic resonance bioeffects, safety, and patient management. New York, NY: Raven; 1994. Masselli G, Brunelli R, Di Tola M, Anceschi M, Gualdi G. MR imaging in the evaluation of placental abruption: correlation with sonographic findings. Radiology. 2011 Apr. 259(1):222-30. [Medline]. Dekan S, Linduska N, Kasprian G, Prayer D. MRI of the placenta - a short review. Wien Med Wochenschr. 2012 May. 162(9-10):225-8. [Medline]. Jaffe MH, Schoen WC, Silver TM, Bowerman RA, Stuck KJ. 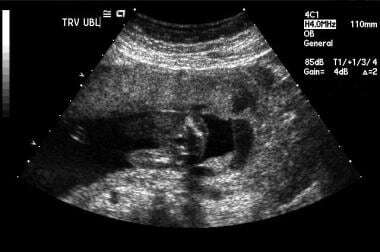 Sonography of abruptio placentae. AJR Am J Roentgenol. 1981 Nov. 137(5):1049-54. [Medline]. Harrington K, Cooper D, Lees C, Hecher K, Campbell S. Doppler ultrasound of the uterine arteries: the importance of bilateral notching in the prediction of pre-eclampsia, placental abruption or delivery of a small-for-gestational-age baby. Ultrasound Obstet Gynecol. 1996 Mar. 7(3):182-8. [Medline]. Harris RD, Alexander RD. Ultrasound of the Placenta and Umbilical Cord. PW Callen. Ultrasonography in Obstetrics and Gynecology. 4th ed. Phildelphia, PA: WB Saunders Co; 2000. Spirt BA, Gordon LP. Sonographic evaluation of the placenta. Rumack CM. Diagnostic Ultrasound. 2nd ed. New York, NY: Mosby-Year Book; 1998. 1337-58. Nyberg DA, Cyr DR, Mack LA, Wilson DA, Shuman WP. Sonographic spectrum of placental abruption. AJR Am J Roentgenol. 1987 Jan. 148(1):161-4. [Medline]. Nyberg DA, Mack LA, Benedetti TJ, Cyr DR, Schuman WP. Placental abruption and placental hemorrhage: correlation of sonographic findings with fetal outcome. Radiology. 1987 Aug. 164(2):357-61. [Medline]. Murphy NJ, Quinlan JD. Trauma in pregnancy: assessment, management, and prevention. Am Fam Physician. 2014 Nov 15. 90 (10):717-22. [Medline]. Glantz C, Purnell L:. Clinical utility of sonography in the diagnosis and treatment of placental abruption. J Ultrasound Med. 2002. 21:837-40. Sholl JS. Abruptio placentae: clinical management in nonacute cases. Am J Obstet Gynecol. 1987 Jan. 156(1):40-51. [Medline]. Yeo L, Ananth C, Vintzileos A. Placenta Abruption. Sciarra J. Gynecology and obstetrics. Hagerstown, MD: Lippincott, Williams & Wilkins; 2004.